Irene Edna Blum was born May 1, 1927 to William B. and Pearl (Caswell) Sossaman in Greenwood, Mississippi. Irene was the second oldest of five children when her mother passed away when Irene was only five years old. Irene accepted the hard life as the daughter of a sharecropper and helped raise herself and her siblings. Irene was unable to finish high school and moved to Minneapolis to make her own way in the world when she was only 16. There she met Harold Blum. They were married on December 24, 1950 in Cedar Falls, Iowa. They lived in Detroit, Michigan where they were blessed with four children. Harold and Irene moved their family to an acreage near Parkersburg Iowa in 1967 where they raised their children and taught them the values of hard work, animal husbandry and gardening. Irene often told her children "if you don't grow it, you can't eat it". Irene's life changed drastically when her beloved Harold passed away on August 1, 1978. She sold the acreage and moved to Cedar Falls, where she worked in food service at the University of Northern Iowa for over 20 years. At UNI, the students became her family as she strived to memorize all their names. She developed strong and lasting relationships with her students that lasted even after her retirement in 2001. Irene suffered from dementia, Alzheimer's and failing health. 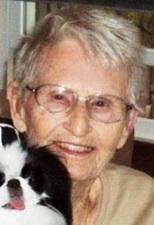 She moved to The Waterford Assisted Living in Lincoln, Nebraska in 2007. There she became friends with the residents and staff and received excellent care. Irene passed away at 9:12 PM on December 23, 2009 from complications of pneumonia and influenza B. She was just in time to celebrate her 59th wedding anniversary with Harold. Irene is preceded in death by: her parents; her husband, Harold Blum; her daughter, Carol (Blum) Janssen; her great-granddaughter, Hope Ohrt; her sister, Marie Horton. Irene leaves behind: her son, John Blum of Waterloo, Iowa; her daughter, Grace (Blum) Robinson of Lincoln, Nebraska; her son, William Blum of The Colony, Texas; her sister, Marjorie Calhoun of Elaine, Arkansas, her brother, Robert Sossaman of Memphis, Tennessee; her sister, Amanda Rocek of Minneapolis, Minnesota; 11 grandchildren; 8 great grandchildren. Visitation will be held Tuesday, December 29, 2009 from 4 - 8 PM and Wednesday, December 30, 2009 at 9:30 AM with services at 10:30 AM at the Dahl-Van Hove-Schoof Funeral Home, 1825 West 12th Street, Cedar Falls, IA 50613-1699 with burial at the Greenwood Cemetery.